I have found an awesome deal with a great price £179.99! You can get it from www.go2games.com. The ultimate games and 4K entertainment system. Play the greatest games line-up, including Xbox 360 classics, on a 40% smaller console. 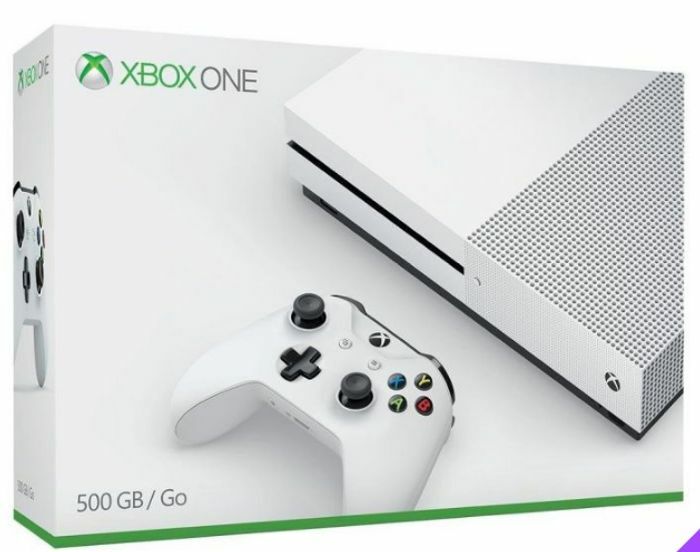 Just don't let its size fool you, the Xbox One S is the most advanced Xbox ever. Experience richer, more luminous colours in games like Gears of War 4 and Forza Horizon 3. With a higher contrast ratio between lights and darks, High Dynamic Range technology brings out the true visual depth of your games. With four times the resolution of standard HD, 4K Ultra HD delivers the clearest, most realistic video possible. Stream 4k content on Netflix and Amazon Video and watch Ultra HD Blu-ray movies in stunning visual fidelity with High Dynamic Range. Configure your Xbox One S to turn on other devices, like your TV, audio/video receiver and cable/satellite receiver. Whether you're playing a game or watching a movie, the integrated IR blaster will get you to the action faster, allowing you to leave your remotes behind. Experience the enhanced comfort of the new Xbox Wireless Controller, featuring a sleeker, more streamlined design. Get up to twice the wireless range. Stay on target with textured grip. And with Bluetooth technology, play your favourite games on Windows 10 PCs, tablets and phones. Excellent deal with amazing price! What do you think of this Go2Games deal?